Dad, in you, I can see a young man turning into 30 with the 30 years of experience. Happy 60th birthday! I’m so happy to be able to celebrate this beautiful day with you. Lots of love for you! Cheers to your successful life! My dear friend, welcome to the 60’s club! You’ve done a great job during these years and it’s time to do what you like. Wish you much health, peace, and joy! Enjoy a lot this beautiful stage and have fun! You look like 21, behave like 14 and feel like 25. Happy 60th birthday my young-at-heart grandpa! Sing, dance, and enjoy the day with others because you’re not old yet, you’re only 60. My lovely mom, happy 60th birthday! You’ve sacrificed all your time and energy for us. You still treat me like a little girl and fight with anyone for me. Thank you for being my mom. Be healthy and fit as always! It’s time to celebrate the most awaited day of this year. Happy 60th birthday, beautiful grandma! Wish you much health, and a lot of happiness! Have a colorful and enjoyable day! My evergreen grandpa, happy 60th birthday! Today, we are celebrating your 6 decades of memory, 5 eras of wisdom, 720 months of love, and 21915 days of satisfaction. Cheers to 60 years! You have at least 60 reasons to smile, at least 60 people to be loved, at least 60 things that we love about you. Happy 60th birthday, my beloved grandpa! Congratulations on your 60th birthday! Forget all the pain and failures of the past and keep remembering the beautiful memories and look forward for a wonderful life ahead. Many happy returns of the day! Dear mom, I have seen many ups and downs in your life and all the time you’ve handled the situation smoothly and with courage. I’ve learned many things from you about life. Really proud to be your son. Today is the greatest day because it’s your 60th birthday! May this day come in your life again and again! My dear dad, happy 60th birthday! You’re my superhero and my first love. For me, you’ve done so much beyond your capacity. Love you a lot. God bless you today and always! May the years ahead be filled with fun and laughter! My lovely grandma, happy 60th birthday! You are the synonym of love, spirit, and courage and are the most spectacular and beautiful lady I’ve ever seen. Wish you much peace, love, and happiness! 60 years! Congrats uncle! You’ve always been my inspiration. Thanks for your care and support during these years and hope to continue it. Celebrate all the day and make it unforgettable! It’s a special moment of your life so celebrate it in a grand way. Happy 60th birthday, dad! Always be like this strong young man and keep your heart young. Lots of love from your princess! Happy birthday, teacher! Today you’ve turned 60 and I’m so happy to be with you on your special day. You’ve taught us all the good things and showed us the path of success. I will always be very grateful to you. May God grant all your prayers and keep you healthy! Dear mom, congratulations for completing 60 years! You’ve always thought about the welfare of the others during these years. No doubt that, you have the biggest heart. I’m so happy to be a part of your life. May God always enlighten you, protect you and keep you happy! Dear uncle, happy 60th birthday! You’re a special person in my life about whom I can easily write more than thousands of pages. May you have a wonderful day surrounded by your friends and family! Happy 60th birthday, my better half! It’s a great pleasure for me to grow old at your side. I love your companion and everything about you. I wish to celebrate many birthdays together! Congratulations on your 60th birth anniversary, dear boss! You were a wonderful leader, a lovely colleague, and a perfect friend. We feel bad that you’ve retired but know that you’ll always be the best guide. Many best wishes to you! Dear dad, happy 60th birthday! You’ve always supported me whatever came in life. You only deserve the happiness in your life. May you have a day as unforgettable as I am. 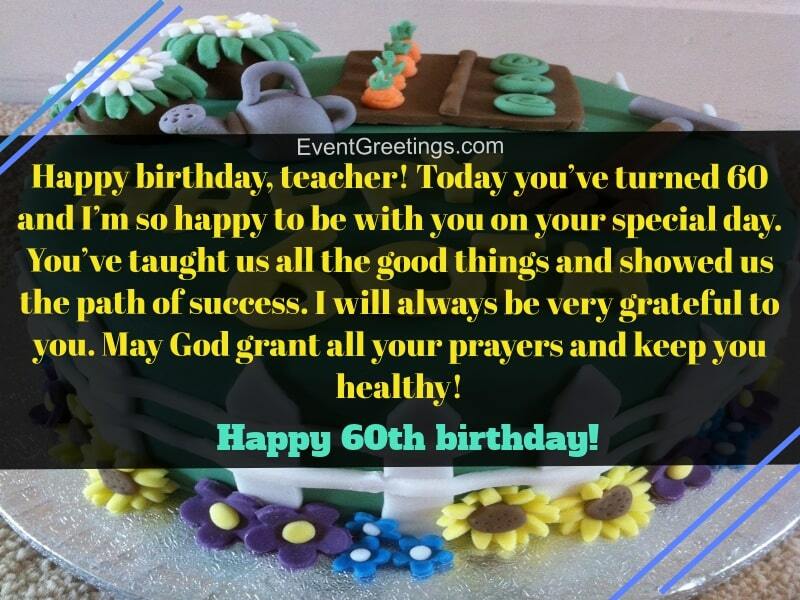 My heartiest congratulations on your 60th birthday! You are an enlightened person who lived with vitality. You’re an example to be followed. All the best for your upcoming years of life! Happy 60th birthday, my friend! I’m much surprised that, it took 60 years to look young. Just kidding! Let’s enjoy our 7 decades of life! Cheers! My dear friend, keep calm and have patience because it’s said that, only the first hundred years are the most difficult phase. Happy 60th birthday! Today is a great day because it’s a beginning of a wonderful year for you. Congratulations for completing the 6 decades. You’re successful in every way and are really blessed to have a lovely family. I wish you get everything that your heart desires. Good luck! We all have to grow old which we can’t change. But growing up is in our hand. My friend, at least grow up now. May your old age become beautiful and colorful! Happy 60th birthday! My dear friend, since long ago we have spent many good and bad times. I’ve always found you in all my need. Thanks, brother. Today I’m here to congratulate you on your 60th birthday and I hope I’ll be there with you on the celebration of your 100 birthday also. Congratulations my friend! I’m so happy to celebrate with you your 39th anniversary of 21st birthday. Have a wonderful and carefree day! Happy birthday, my friend! Enjoy your day and don’t worry much about turning 60 because it’s really awesome. To confirm, ask an 80 years old person. My dear friend, welcome to the 7 decades! You’ve always been a cheerful and stupid man and hope you’ll continue to be like this. May all your desires be fulfilled! Have a memorable 60th birthday! Congratulations my friend for completing 6 perfect 10s of your life! You’re not only my friend, you’re my family member. You’ve given me all the good memories during this years. Thanks for coming into my life. My best wishes for your years ahead! Happy 60th birthday, my friend! I can see the wrinkles on your face which you say the smile lines. I hope that you’ll not forget the things you have learned in the last 60 years. Good luck!